Oru Vadakkan Selfie (English: A Northern Selfie) is a 2015 Malayalam comedy thriller road film directed by G. Prajith and scripted by Vineeth Sreenivasan. The film features Nivin Pauly, Manjima Mohan, Aju Varghese, Neeraj Madhav and Vineeth Read More.. Description Oru Vadakkan Selfie (English: A Northern Selfie) is a 2015 Malayalam comedy thriller road film directed by G. Prajith and scripted by Vineeth Sreenivasan. The film features Nivin Pauly, Manjima Mohan, Aju Varghese, Neeraj Madhav and Vineeth Sreenivasan. 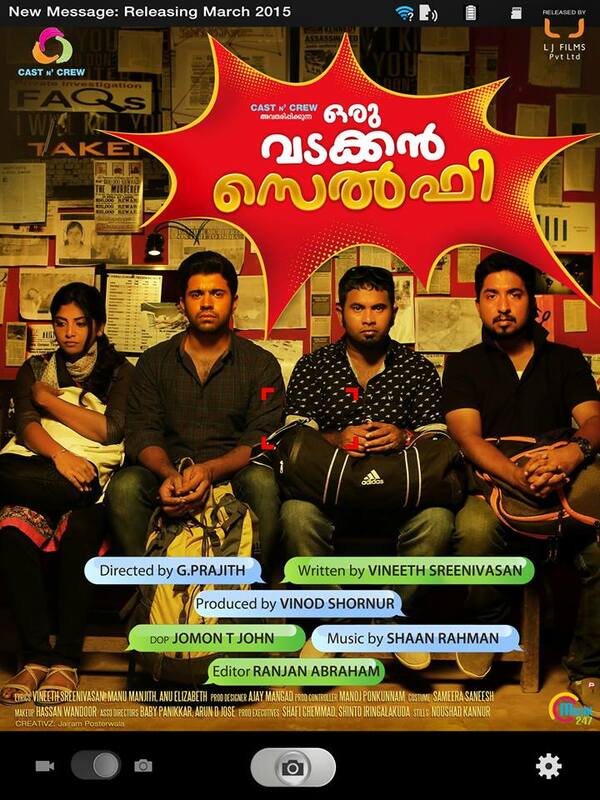 Music is composed by Shaan Rahman.The film released on 27 March with positive reviews and became one of the biggest grosser of the year and some news medias and Kerala Film Producers Association called it the first successful Malayalam film of 2015. The film grossed nearly from theatres against a budget of . Oru Vadakkan Selfie (English: A Northern Selfie) is a 2015 Malayalam comedy thriller road film directed by G. Prajith and scripted by Vineeth Sreenivasan. The film features Nivin Pauly, Manjima Mohan, Aju Varghese, Neeraj Madhav and Vineeth Sreenivasan. Music is composed by Shaan Rahman.The film released on 27 March with positive reviews and became one of the biggest grosser of the year and some news medias and Kerala Film Producers Association called it the first successful Malayalam film of 2015. The film grossed nearly from theatres against a budget of . No reviews available for #OruVadakkanSelfie, Do you know Oru Vadakkan Selfie?, Please add your review and spread the good things.